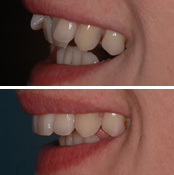 The first step is to find a 6 Month Smiles certified provider and book a consultation. Be sure to find a certified provider and one that is reasonably close to work or home as you will need to attend several appointments over the course of your treatment. Some clinics offer a free initial 6 Month Smiles consultation and it is in this appointment where you will find out if the treatment is suitable for you. During your initial consultation, your dentist will examine your mouth and may take some photographs and X-rays. He will discuss the likely outcomes, timescales and possible problems you may experience during the treatment. You will have the opportunity to ask any questions that you may have and discuss the costs of your 6 Month Smiles treatment. Some experienced dentists or specialist orthodontists will be able to place the brackets immediately without the need for a custom template from the laboratory. This could speed up the treatment time as the laboratory process can take up to 4 weeks in some cases. Once your treatment is finished and your teeth have moved to their final position you will be given a retainer, which is either a removable appliance to be worn at night or a thin wire fitted to the back of your teeth. A retainer ensures that your teeth do not move back into their previous position. The tooth-coloured brackets and wires enable the procedure to be completed with the utmost subtlety and they can only be seen from very close-up. 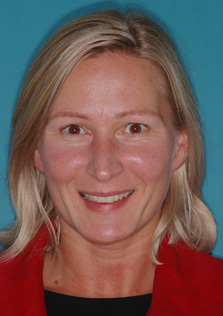 6 Month Smiles are not suitable for severe orthodontic problems, in which case other fixed braces may be more suitable. What questions should I ask during the 6 Month Smiles consultation? How much will the treatment cost and are there any extra fees (hidden prices)? How often will I need to come back for review appointments and are they included in the price? If one of my brackets comes off during treatment will I need to pay more? How long after my first appointment can I expect to receive my braces? Will I see the same dentist / orthodontist for every appointment? Are retainers included in the agreed price? 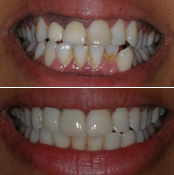 As the name suggests the treatment is usually complete within 6 months. However, the exact treatment time varies between individuals and in some cases can take a little longer than 6 months and others as little as 4 months. This time period is a lot quicker than comprehensive orthodontic treatment which can take 2 years or more, but it is important to understand that 6 Month Smiles only treats the teeth that show when you smile and not the full arch. There may be some mild discomfort during the initial few weeks, but this will disappear once you are accustomed to the braces. Painkillers such as paracetamol should help but if you experience severe pain contact your dentist / orthodontist immediately. The price you pay for 6 Month Smiles braces will depend on several factors, including the practice where you have the treatment, how complex your case is, if you need to correct the upper teeth, lower teeth or both arches and the experience of the practitioner carrying out your treatment. As a general rule of thumb the more experienced a dentist / orthodontist is the more they would charge. Your dentist / orthodontist should outline the costs to you at your consultation. 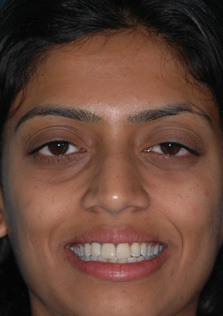 Typically the cost of 6 Month Smiles treatment ranges from £2000 to £3500.